Welcome to the Scottow Enterprise Park interactive site map! To find out heritage information on specific buildings, just click on those that highlight when you hover over them. The hangar has some significance as a standard C type hangar, although individually these are not rare, even in Norfolk due to the large number of Second World War airbases that were built. Despite this, its position as a centre point to the base provides it with a local listing designation. The hangar has wider significance as part of the complete base configuration within the conservation zone due to the completeness of its surroundings. Hangar 3 has local significance slightly above that of a regular type C World War Two hangar due to the scars that it bares from an attack which destroyed what would have been hangar five next to it. This includes bullet holes and shrapnel marks. There are also examples of military graffiti which represent the use of the hangar during the many years of its use. It is one of 26 C type hangars surviving in Norfolk. This building was the station armoury and was constructed in 1956. This is an important building of the era for its specific use, although there are no specific architectural features that distinguish it. It has a central position in the conservation zone and as one of the few buildings that are fully fenced in due to its sensitive use contrary to much the open plan area covered by the zone. The building is significant as it marks the entrance to the base and is the first structure servicemen serving at the base would visit. It was also the location of the security and internment for any wrongdoers from within the base. This building is one of the most significant on site due to the presence of historical medical fixtures from World War Two. It is relatively unaltered from its original design and although the medical equipment was updated the building itself retains many of its original features. The most significant part was the casualty decontamination area with furniture that is either original WW2 or cold war era. Such early equipment is extremely rare as most chemically protected structures upgraded their machinery as weapons developed through the cold war. This allows the processes carried out within the building to be easily disseminated providing background knowledge to the operations of the building. The bomb stores at the former RAF Coltishall are some of the most complete Expansion Period bomb stores remaining in the country, and are significant not just for the structures themselves, but also for the setting (including bunds and roads). Building 223 (A, B, C and D) were all constructed in 1958 when the base expanded into the jet era. They were stores for Firestreak and Red Top Missiles. These stores form a key part of the explosives storage area playing a role in its character thereby forming a key part of the conservation zone. This provides local but not national importance as they are standard military type buildings. This building is the centre piece of the conservation area, situated in front of three of the hangars in a symmetrical arc. The building is locally listed and distinctive to the former airbase use. The original structure was bombed in 1944 and rebuilt to the original plan. The 3rd storey control tower room at the top of the building provides a 360 degree view of the site. 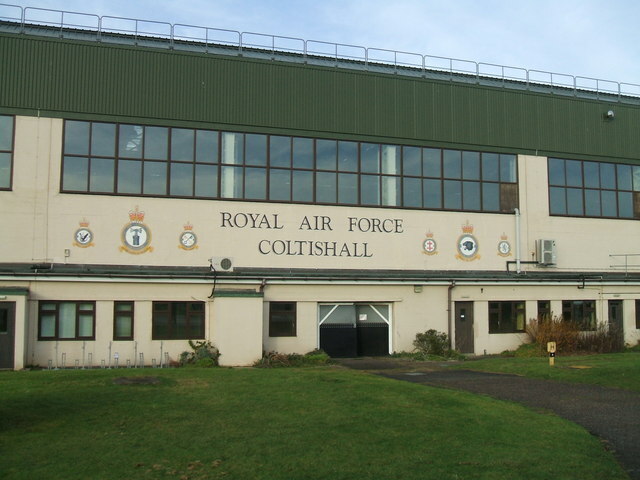 This building is distinguished form its neighbouring hangars through the inclusion of the Royal Airforce Coltishall Banner and coat of arms. Apart from some internal cosmetics, Building 15 retains many of its original features as a parachute drying room. It has more recent extensions that now form offices. However, these have been done in line with base requirements so therefore fit into the active airbase narrative for the building. Building 35 previously acted as the Station Headquarters at RAF Coltishall, and was constructed in 1939. This building in more recent times was the ground Defence Operational Centre. It is located in the former decontamination centre and was constructed in 1940. This building has value as part of the conservation zone as one of the original structures on the airbase. It is a defensive building with the earthworks adding to the military character of this area of the base. The runway at former RAF Coltishall is approximately 7,500 ft in length. During the post-war period the airfield was modified on a number of occasions to accommodate the deployment of new aircraft and weapons system. One of the key requirements for the new jet aircraft was an asphalt runway; this was laid approximately south-west to north-east, with quick reaction platforms at either end. Building 349 is one of the more significant Cold War heritage assets at the site and has high historical interest due to its purpose having been to train Jaguar pilots. During World War II, fighter aircraft were considered to be very vulnerable when on the ground either from air attack, or, during the early years of the War, from possible ground attack, and elaborate precautions were taken to prevent the loss of, or damage to, essential aircraft when not in action. As a result, fighter aircraft were often held in dispersed pens located around the perimeters of airfields which, nevertheless, had easy access to the main runways. This monument includes the buried and standing remains of a fighter pen and eight pairs of blast walls. The blast walls date to the 1950s and are built of concrete. They lead from the runway to the south-east of the fighter pen. Eight pairs of walls provided shelter for jet aircraft and have adjacent concrete hardstandings for crew huts. The fighter pen is known as a type A which was constructed in accordance with Air Ministry drawing 11070/40 and housed a single-engine fighter such as a Spitfire or Hurricane. It is the only remaining fighter pen at the base and remains substantially intact, and unusually, without associated earthworks. The pen comprises a single tarmac floor for a single-engine fighter, a central wall and enclosing walls in an arc which stand some 3m high.